Boooooooooo, watch out for the ghosts, goblins and all kinds of candy seeking ghouls as they make their way around town this evening. I hear that if they don't get a treat, they will give you a trick like changing your TV channels and things like that, so to avoid their wrath have plenty of candy on hand. Michelle and I will be heading out to Jean's to hand out multitudes of sweet treats to the Trick or Treaters this evening. Last year was the first year Michelle experienced "Halloween at East Gate", the place where the CPM rating (Candy Per Minute) is higher than any place else. Last year the MoHawk Bowl was the same time, this year the MoHawk Bowl is today, but many hours earlier. 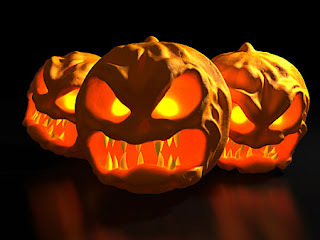 Have a great Halloween and protect yourselves with candies. Reeses Cups are my chosen favorites. Did you say football? The Mountaineers take center field tonight when they travel to Raymond James Stadium in Tampa Florida to take on the University of South Florida Bulls. The Bulls have beaten the Mountaineers in two of the last three seasons (WVU winning last year) so we will definitely have our hands full. What about the High Schools? Well the MoHawk Bowl will be played tomorrow afternoon at University High School. Both schools are trying to earn their playoff rankings, both schools should be fine win or lose to make the 2009 State Playoffs. Notre dame HS travels to Clay Battelle to take on the undefeated Cee Bee's. Trinity is at home trying to extend their winning streak to three games in a row!!!! I hope everyone is ready for the weekend, because I know that I sure am. It has been an event filled week or so to say the least. 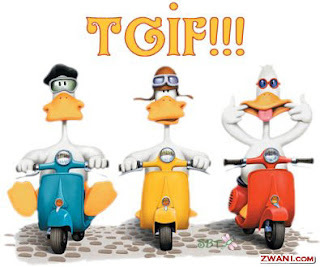 Enjoy your Friday and have a Great Weekend. 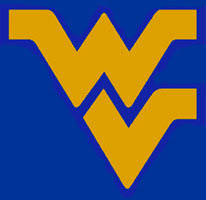 Let's Gooooooooooo Mountaineers!!!!!!!!!!! With fears of the Swine Flu (H1N1), the flu season is definitely upon us. My Nephew Calvin has been sick most of the week, Pam was really concerned that it could be swine flu, but it turned out to be strep throat. Still not something very pleasant to have, but not the swine flu. I's seen many people on Facebook also have a lot of concerns about this. I thought I would put together a short list on what you can do to protect yourselves. Frequent Hand Washing. This is probably one of the most important habits you can encourage your family to do. Hands Off Face. Continually remind your family to keep their hands away from their face. This is a habit we all have but with conscious effort we can certainly minimize it. Salt Water Gargles. Gargle with a salt water solution in the moring and evening. This helps to keep any virus from proliferating. Nasal Saline Spray. Use a saline spray to flush nasal passages at least once a day. Blow nose well afterwards. Vitamin C and Yogurt. Eat foods plentiful in vitamin C and also eat Yogurt, both will increase your immunity to colds and viruses. For better Vitamin C absorption, also take Zinc. Drink Warm Liquids. Drink plenty of warm liquids, such as tea and soup. Warm drinks help flush viruses from the throat into the stomach, where viruses can no longer survive. Plenty of Rest. Our bodies need rest to keep our immunity strong, so this is especially important during flu seasons. Just do these simple steps and you should be able to lower the risk of catching and lower it's impact if you do catch it by doing this. 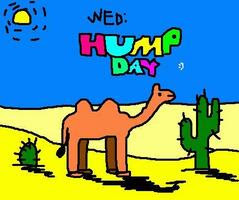 Well we are getting there, it's once again Hump Day and it is all down hill from here on out. I have to hand it to the facebook Crew. We found out yesterday that Morgantown High was on lock down and spread the word in a few short minutes. I have to say having a large social network when using a social networking site can work to your advantage. I read it on Renee Tressler's status update who drove by the school, called Michelle and she called Hayley and got the quick scoop all in about 5 minutes. Pretty good network we got going there. Michelle has been coming down with the flu the last few days, she really wasn't feeling very well last evening. I guess my brother Gary isn't feeling all that well either, I guess he cut his thumb real bad at work yesterday and cut some ligaments. I was talking to Jean and she said they had to put him to sleep to repair it. Well I guess in dog years he is about 280, so I guess he lived a long enough life and could be put down..LOL He'll be fine, if I know him he'll take a day or two off and be right back at it. * 591 Days since mine and Michelle's first date. How many people do you know that keep track of these kind of things? * Pam called last night but I missed the call, Calvin has a case of the flu, but she doesn't know if it is the swine flu. It's something that she may want to pay close attention to as a girl that Hayley has went to school with since Kindergarten has died from swine flu. Morgantown's only confirmed death from it. * I lost once again in fantasy football. I lost three, won two and now I've lost two again. I need to stop the skid if I want to get into the playoffs and have any chance for the money. * Michelle is starting to come down with the flu again, it's not the swine flue but I hear that it could very well be the frog flu. I think you get it from hanging around horny toads. * Looks like both Amy and Val are sticking to the tax thing. I guess they aren;t tired of crunching numbers yet. * I did see my nephew randy at Wal-Mart Saturday evening. He was with his girlfriend and was walking out as we were walking in. Yeah I know, it's nose back to the grindstone and time to get back to what we just love to do. I may have a semi-busy week this week, I'm going to have to take a trip to the bank either today or tomorrow and file a fraud claim with my bank for the transactions against my account in New Mexico and El Paso Texas this past weekend. I have got my computer most of the way back to speed from the reformat, I still have some work to do on it. I do have all the immediate files and programs updated and re-installed. No big rush on anything else, I'll install them as I need them. All things considered it was a pretty good weekend. Did anyone watch the Steelers yesterday? Not one but TWO defensive touchdowns in the fourth quarter to knock off the previously undefeated Minnesota Vikings. Brett Farve looked sharp for the Vikings, except the 14 points he gave us on turnovers. Oh well, weekend is over, things will be returning to normal here and it's back to work. Well let me first start out by talking about our pumpkin. Michelle and I carved out our first pumpkin together last night. Hayley was the one who chose the design and Michelle and I carved it out. I have to sat that it was a lot of fun and I really enjoyed doing this, we had bought a designs book earlier and some tools and we had at it. I got a call from my banks fraud department, seems someone has my check card information and was ringing up purchases out the ying yang in New Mexico. Michelle and I were at Wal-Mart earlier in the evening and the locations of the two transactions must have set off a red flag, BB&T caught it, canceled my card and is issuing me a new one. I'm going to have to wait until the transactions clear ( I know of a minimum of $160.00 worth with two more pending) and I have to go and file a fraud claim with my bank. May take a few days, but I'll get all my money back. It's just the inconvenience on my part and the waiting game of waiting for a new card and clearing those fraudulent transactions. Which had me thinking...how did they get it? My website has been under attack for over a month now. I have went around and around with GoDaddy about it. I actually installed one program and it went corrupt in no time. I spoke with their tech department and they felt it was coming from my computer and I should change my FTP information (which I did a month ago). Well it's not hard to figure out 2+2, I think my computer has been corrupted and is the culprit. I thought I had it fixed, but obviously not. The solution you may ask? No sleep last night, reformatted my hard drive and re-installed windows and changed my online passwords to my financial accounts. Forgot the write a blog today, we woke up early and headed to iHop for breakfast and forgot to write one for today. Mountaineers and UCONN today at noon. You looking for High School Football? It's once again gamenight and that means it's time for some Friday Night Lights. University visits Preston, Morgantown entertains John Marshall, Clay Battelle travels to Tygart's valley and Trinty, fresh off of the first victory in school history tries to extend that winning streak to two games. WVU entertains a brave group of UCONN players fresh off the loss of a team mate last Sunday Morning. WVU plans to wear a #6 on the back of their helmets to honor Jasper Howard, there will be a planned moment of silence, fans are encourages to wear a white arm band with a blue #6 on it and fans have been asked to give the UCONN team a standing ovation as they enter the stadium. Last night Michelle and I assisted my old buddy Smitty and his with Steph as they closed and finally were able to move into their new home. Hew sold his house and bought another one. Beautiful home, big living room, cathedral ceilings and a 12'x 36' deck with a gorgeous view. I told Smitty I could retire on his back deck. Oh well, it's off I go one more time before the weekend. I can;t win for some reason with my website, and I think it is on the hosts end. I actually installed a third party piece of software on one of my domains today and the site within two hours has been rendered useless and unusable because of something happening behind the scenes. I know what files are being affected and which ones are being created, I can go in and replace them all day long, but there is something behind the scenes writing additional code to multiple domains that I have. This is the fourth time I have contacted GoDaddy about this issue and AI have a ticket in with their resources team. If they don;t resolve this quickly, they will lose this long standing customer. 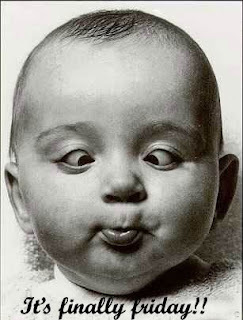 Alright, we have made it to hump day and it's all downhill to the weekend after today!!!!! Come on Friday, I'm ready for another fun filled weekend. Tonight, weather permitting Michelle and I will go and watch Arron play his last home game of the season at University High. This will be our fourth game that we have attended this season and know that basketball is right around the corner. I'm sure we'll be attending a few of those games as well as he tends to play all three sports (Baseball, Basketball and Football). 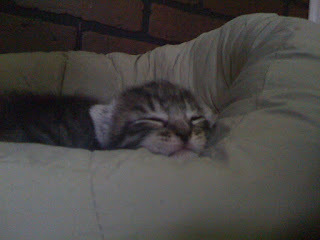 * The kittens are really getting their legs now, the male cat (Psycho) is quite adventurous and king around the house. He is a real Geo CATcher. * 585 days since mine and Michelle's first date, I really am one lucky guy. * Congrats to both Amy and Val as they both started their new jobs yesterday. They are studying to be H&R Block Tax preparers. * Layla is going to have a Doctor's appointment today, she is going to have an ultrasound as they think she may have developed a heart murmur. They are going to check it out and get a better diagnosis. * I tried like heck, but my two game fantasy football league winning streak has come to a halt. The three time defending league champion took me to the woodshed this week, I'll get him the next time we go at it if I have the chance. * The kittens will be four weeks old tomorrow. We are starting them on solid kitten chow and introducing them to a clay filled kitty litter box. * Have I mentioned that I hate snow? Not that I just dislike it, but I hate it. Wonder where Phil is and if I can start bribing him this year early to not see any shadows. I already miss both Spring and Summer. * Looks like a lot of kids were out sick yesterday from school, I guess there is a nasty flu bug going around and it's hitting the area pretty hard. I swear that weekends are just a little too short, it seems like just yesterday it was Friday afternoon and I was picking Michelle up from work. Oh well, it's back to the grindstone today. We watched the Steelers game at home yesterday, Michelle's niece Samantha and nephew Tommy both stopped by for a visit and to cheer the Steelers on to a 27-14 victory over the Cleveland Browns at Heinz Field. Michelle made dinner and we all watched the Steelers put a whooping on the Brown's yet once again. Michelle and I went to her Brother in law Jim's auction yesterday. Walked out with some nice things. We were looking into buying an electronic meat slicer (deli type) so that we could buy lunch meat in bulk and slice it up to save a few bucks on our weekly grocery bill. I managed to pick one up that has never been used pretty cheap. 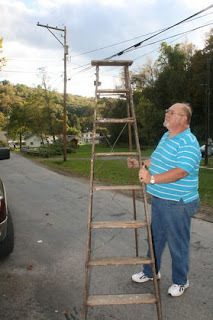 My brother in law George went to the auction also and found some nice deals. There were some really nice items going pretty dirt cheap. I'll let everyone know the next time Jim has another auction. We do have a nice day planned today, if you consider running around grocery shopping a nice day LOL. Steelers game at 1:00 and I think Michelle is going to make a few things, if anyone is interested in coming over let me know and come on over. Last night was the start of the 2009-10 Mountaineer basketball season. Mountaineer madness as they call it was in full effect for the evening. Fans jammed into the Coliseum to watch this edition of the Mountaineers and try to help Huggins in landing one of the premier players in the country, Adreian Payne. The Mountaineer maniacs were out in full force to help coach Huggin's land this prospect, I hope we sign him, but that is all up to him to decide. The evening started off with the introduction of both the entire Women's and Men's teams and giving them all a chance to walk down the carpet. Both coaches were given a few brief moments to say a few words and then it was time to move on. After that there was a slam dunk competition, defending Champions Devin Ebanks and John Flowers were the finalists. John Flowers ended up winning the competition with the dunk at the end of this BLOG where he jumped over three students to win the competition. The culminated with two ten minute scrimmages by both the Women's and Men's teams. The men are preseason ranked #5 and the Women are going to also be awesome. I recommend checking both teams out of you get a chance this season. Michelle's brother in law Jim will be holding the Fall Family Auction at the Cassville Volunteer Fire Department at 10:00. A few of the items that will be up for Auction are listed here. Michelle and I will be going up to assist Jim and Chris with the Auction. Lot's of great deals available, come on over and see what you can find. Wow, has it been that many years since I first saw you wheeled out of the delivery room. Now you have grown up into a beautiful young lady and you are a college Freshman. Sitting in some of the same seats that I sat in just a few years ago. Anyways, if you see this wonderful young lady today, make sure that you wish her a very Happy Birthday!!!!! On a Personal note I would also like to wish her a very Happy Birthday!!! First and foremost, Gates open at 6:30 tonight for an autograph session and tonight is the start of Mountaineer Madness at the WVU Coliseum. There will be an autograph session from 6:30 till 8:00 and then the madness starts at 8:30. Me and Michelle will be there and will be eagerly anticipating the 2009-10 edition of the West Virginia Mountaineer Basketball team. Most pre-season polls have Huggins and the boys ranked in the top 10 already. This could be an interesting year in Morgantown. Come on out, it will be a lot of fun. High school football is your concern? #12 Morgantown will travel to #1 Brooke this evening and try to extract some Mon County revenge on the Bruins for them beating University High last week. Watch the Mohigans pull the upset, I'm calling it here first. University High will be entertaining John Marshall at home, Clay Battelle will travel to Cameron and Trinity travels to Williamson. This was a short week for me, and I am glad it is over. Made a lot of progress career wise (even got a call about another job that pushes me much higher in Cranberry if I would choose to go that route), I have signed my offer sheet and returned it to Sexton already, I'm happy with where I am at right now. As I mentioned Tuesday I have a career announcement to make. As I said SAIC my current employer has lost the contract at NETL where I work. SAIC the prime on the existing five year contract, but when the contract came up for rebid it was broken down into a series of contracts. SAIC had bid on three of the contracts that cover GIS services and failed to win any of the three. I had already received my layoff notice effective November 14th as well as every other SAIC employee who were contracted to NETL. Two of the three contracts were awarded ta couple of months ago and the third was just announced this past weekend. I had resume's in with the two primes who won the two announced contracts and have exchanged quite a bit of paperwork with one of them including my salary history. An office mate of mine got his paperwork in early and had his interview with them and has an offer letter in hand. I have an offer in hand with a substantial pay raise from a company that is subbed to all three winning contract bidders. They are jumping with joy and so am I, I said three months ago what the best scenario for me was and it played out exactly that way. I have an offer in hand and will sign and submit it tomorrow to Sextant Technical. A small company of four people (and adding two more so far) and a wealth of GIS resources. We will be developing and hosting the GIS Touch Table both here in Morgantown and in Pittsburgh. They are wanting to form a one stop GIS services company at NETL that can cross over any and all contracts. Sextant has a vision, a gameplan, are proven winners and get the job done. I am very fortunate for this opportunity to be working with the people I am working with, Sextant is the innovators of pushing the envelope in GIS data, Analysis and presentations. Forget that it is the biggest and best offer of my professional career, this is my ideal job. Fourth company in 18 months, layed off twice, voluntarily left for another job once and never missed a beat. As I look back at my decision to go to school, it just reconfirms it was the best decision I ever made. 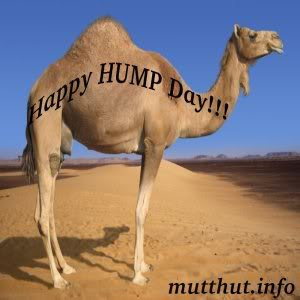 Hey, Happy Hump Day!!!!! We've made it, it's over the hump day and we are on the downside of the work week. Last night Michelle and I went over and visited Trish and Layla. Arron was sleeping so we didn't get a chance to see him, but we did manage to help Trish place a bid on a Halloween Costume for Layla. She is going as a....I'm not going to tell you, Its be a surprise. The kittens are doing fine, they are stating to get their legs and are walking around. The little boy kitty is and has been pretty adventurous around the house. The Momma has them in Hayley's room, but the world is just a little too big for the adventurous one. Over the hump and down the hill we go!!!!!!! * I love starting the week on Tuesday, Monday's really are not my favorite days of the week and I had yesterday off for Columbus Day. * I'll have a career announcement coming up within the next month or so. SAIC is a contractor for NETL and they lost the new contract this time around. No fears, I'll let everyone know how everything played out once everything is done. I'll just be changing companies, not jobs or even where I sit on a day to day basis. * I am thinking about stream lining my website, it's been 4-5 years since I last redid it and there are a lot of changes that need to be made. There have been a lot of headaches and problems as of late, I think I have the problem fixed though right now. * You'll notice my picture site is gone, I had to wipe it out and re-install it on my host. I'm going to have Michelle help me repopulate it again with things we want. I have all the images on my local computer if anyone wants a specific file. * Shitzngiggles.com is another site I am going to redevelop. The first time I bought a cheap gaming site and put it up and that's what it was, a cheap gaming site. Might be looking in another direction now that I have the php issues worked out and it displaying again. Ahhh yes, I have a three day Holiday weekend and as everyone else heads out today to stick their noses back on the grindstone, I an fortunate enough to have my weekend extended one more day. I really don't have anything planned short of watching a few movies and relaxing for the day. I had a great weekend, and am fortunate to have one more day!!!! Yesterday was an awesome day, it started put with Michelle and myself going to MiHaley's with Jean to watch the Mountaineer Game. WVU pretty much handed Syracuse pretty easily in route to a 34-13 win. After the game Michelle and I went to Coopers Rock in search of Geocaches as Haley and a few friends had come over to start getting ready for her home coming dance. We did finally get our Milestone 100th cache yesterday. After we got that 100th cache we headed home to get a few pictures of Hayley before she left for the dance. The weather was a little less than cooperative yesterday. It started raining yesterday and the whole day was just one big blah. The balloon race was scheduled for yesterday afternoon was canceled and the weather has been less than cooperative. Hopefully today will be a little more cooperative weather wise. 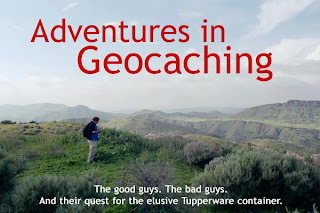 We're currently at 98 Geocache finds and may possibly be planning on a trip to Cooper Rock today to see the changing of the leaves, weather permitting. Maybe we'll get another one or two today to push us to the ceremonial 100 find mark. Rain, rain go away, come back again on a day I have to work. Last night was pretty fun, it started out with me and Michelle going to light up night. We ended up seeing Amy and Kaiden there, but light up night was a little less than spectacular. After that we met Jane and her kids at Pizza Hut for a late dinner and some BSing. She is in transit to DC, her and Chris will be having dinner with President Obama Saturday night. OK< on to tonight. High School Football on tap for this evening. University High hosts the number 2 ranked team in the state when Brooke comes to town. Hopefully the Hawks can end the Bruins undefeated season tonight. It's homecoming tonight for the Mohigans as they host the North Marion Huskies at Pony Lewis. Undefeated Clay Battelle puts their undefeated record on the line against Valley Wetzel and Trinity travels to Pendleton County. I think we may try to head to Coopers Rocks this weekend to see if the view is prime for the trees changing colors. Have a great Friday and a better weekend. Come one, come all to the 2009 edition (2008 was missed) of the Mountaineer Balloon Festival. The carnival portion of it all kicks off this afternoon at 3:00 with the fair gates opening and the carnival kicking it off. The night of festivities will start up with a photographic opportunity of Light up Night at 7:30. 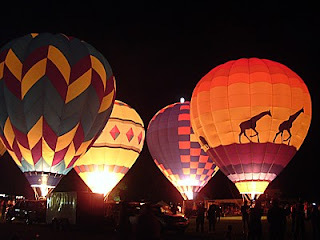 After the sun goes down for the day and it starts to get a little bit dark, many of the balloonists will inflate their balloons and at every timed whistle blow will start inflating their balloons bringing a wonderful illumination to the night sky. It's been a number of years since I have attended this event, I think the last time I went it was behind the State Police barracks about 20 years ago. Tonight however with my sweet heart in tow I will be returning to the event and grabbing a few pictures. Bring your camera and get ready for a chance at some beautiful photography. Last night Michelle and I went and watched Arron and the UHS Hawks pummel BU 36-0 at the school. It was a dominating performance by the Hawks. Let's see, Monday....Check. Tuesday....check. It's Wednesday and hump day. I have to say this this week is going by pretty quickly and starting tomorrow with Light Up night, my long weekend could get an early start. Nothing planned for my boring life today, but like I said tomorrow is light up night and then it is Friday. I do have to say as someone who started out with Myspace, and later switched to Facebook that I really like Facebook so much better. I think I have been able to conect with more people out of my past than I could have ever imagined. I think it is where I spend the majority of my internet time anymore. I'm going to be making changes to my website in the near future. It's had some trouble recently and I'm not getting much support from GoDaddy that I am seriously considering moving my site to another host. I think GoDaddy just got so big, that they quit caring. I honestly haven't been too happy with them since they changed the back end a couple of years ago. Big YELLOW Dance Cam - "Brick House"
People might remember this guy as the guy from our Steelers Triva Championship team as the guy who answered everything. * Every once in a while you get writers block or you just have a few smaller things to say rather than building a larger story. * Today is brought to you by the number 571. It has been 571 days since mine and Michell's first date and I have managed to trick her into keeping me this long, I must be doing something right. * Hey a early warning, this Thursday Night will be Light Up Night at the 2009 Mountaineer Balloon Festival at Mylan (don't they name everything after him?) Park. Be cheering for Mountain Momma II at all of the balloon races. The Pilot is an old friend of mine and also works with me at SAIC, but this will be changing next month (More on that later). Bring your camera and get a good spot to watch this night time wonder. * Would you believe that I have finally won a week in my Fantasy Football League. I started out 0-3, but finally got in the win column this week. Would you believe that it has been a while since Michelle and I actually got the day to spend Geocaching yesterday. Well, the weather was nice today and we took the GPS, although we never used it, and spent the day grabbing a few Geocaches around Morgantown. I kind of wanted to get out 100th one this year and with the four that we got yesterday that puts our total at 98 caches found and one hidden to date. I want to get at least two more finds to reach that magical milestone of 100 just so I can say I've done a hundred of them. We got one at the Old Alumni Center, one at the Law School, failed to find one at the Core Arboretum, and found a couple in Woodburn to round out the day before we picked Hayley up and gave her a nice chance to drive around and practice a little bit yesterday. It was a great day that I got to spend with a couple special ladies. Maybe today will even be better. I have to say that I did have a good weekend though. A day of geocaching Saturday and yesterday Michelle made two of my favorites for dinner, haluski and pierogi casserole. I was in seventh heaven to say the least. I did help Brittany with a little bit of Geology homework yesterday. I walked her around campus and showed her a few places that were relative to her homework. You know being a Professional Geographer and Geocacher one would think I know how to read maps. I can make them, and I can make some rather good ones, but the maps on her homework assignment had me a little confused and I headed the wrong direction initially. I think we got her taken care of though as we found what she was supposed to see. Do I really have to go to work today? 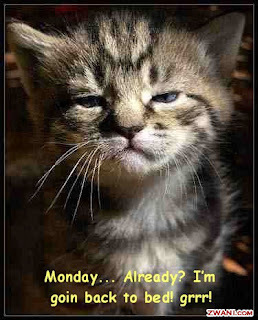 Is it really Monday again? As the thing we call a weekend is winding down, I took a picture that pretty much sums up my relaxing weekend so far. This is one of our yet to be un-named kittens and I think this picture explains the weekend the best. Ahhhhhhhhhh, relaxed. Unlike mist of my blogs, I am actually writing this one real time instead of writing it the night before. I have to say that Blogger has been less than cooperative this morning as it is running pretty slowly. Actually Google in General, not the rest of the web, is a little less than its normal self this morning. It is October in West Virginia, a time of the year when all of the most beautiful colors that your optical nerves could observe in nature will be presenting themselves here in the next few weeks as the trees start preparing to shed their leaves and prepare for winter. It's a time for festivals like last weeks Buckwheat Festival and the upcoming Balloon Festival that we will have here in the next week after a one year hiatus last year. How about that Mountaineer Game last night. We weren't the sharpest team out there, but on 220 yards rushing from Noel Devine the Mountaineers pull out a 35-24 victory over the Colorado Buffaloes. Into High School Football? Well the big game tonight is when the Undefeated University High Hawks at 5-0 travel to the Undefeated and 4-0 Fairmont Senior Polar Bears. This should be a good game, go Hawks. Preston High Knights travels to my Alma Mater Morgantown High tonight to take on the Mohigans. The Undefeated Clay Battelle CB's are idle this week and Trinity travels to Hancock Maryland to play. A Happy Birthday/Condolences goes out to Chris Ostien. Chris celebrates his birthday today but with a heavy heart as he heard a couple of days ago that his grandfather has passed. Chris worked last night's game , runs the big scoreboard, and is off today for the funeral. Have a great Friday and start of another weekend. It's gameday here in Morgantown. The Colorado make come to Morgantown this year as we traveled to Boulder last season. The 2-1 Mountaineers will be looking to rebound from last weeks loss to Auburn and get extract a little revenge for the overtime loss we suffered out there last season. Jarret Brown should be ready to go tonight, he was injured in his last play last game. Hopefully he will be 100% and be able to play like he has shown us he can tonight. When he is on his game he is one of the best around, that's a strong statement but also a true statement. Maybe Noel Devine can reel off a couple of hundred yards rushing tonight to help alleviate any stress from the passing game. Devine a very explosive playmaker is just one of a handful of 5'8" speedsters the Mountaineers carry on the roster.